The day Pope Benedict XVI is inaugurated as head of the Roman Catholic Church at an open air Mass in Rome, the feelings of hundreds of millions of people throughout Latin America, the world's most populous Catholic region, are reflected in its newspapers. While some commentators welcome the new Pope, others argue he is a conservative force in a region which they feel needs a progressive. The Catholic Church is today threatened with an indifference towards religion which seeks to undermine centuries of tradition and wisdom...a degrading of enduring morals. 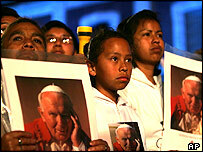 This indifference is one of the principle issues Benedict XVI will have to tackle during his papacy. He is the new head of Catholicism who will lead the faithful along the true path. Christians must pray and be confident. A Pope who might just surprise us. To anticipate he will prove to be a conservative Pope is to fall into a rather serious reductionism. It is to ignore that a Pope is and always will be, because his role demands it, a man who is open to all currents and all the inspirations of the spirit, to all the challenges posed by the timelessness of faith. Joseph Ratzinger is now Benedict XVI. A man who has left behind much. And will probably look at the world, and himself, with new eyes. This is a sad day for Latin American Catholics who were in need of a leader who had some understanding of the needs of those marginalised by the capitalist system, and not somebody who always persecuted the progressive wing of the Church. Long live Liberation Theology! As a practising Catholic, I wish the new Pastor Bento all the divine wisdom to enable him to lead our Church with love and authority. I believe it is unjust for any condemnation before he has had a chance to prove himself. I am certain our Church is in good hands. Those who criticise the Pope are not Catholics and don't understand the doctrine of our Church. Benedict XVI has assumed the post under the sign of an austerity deeply rooted in the institution [of the Catholic Church]. The new Pope will seek to reaffirm the dominion of faith over science, even though this signifies losing sight of advances in human knowledge... In an interview with Jornal do Brasil, Joseph Ratzinger stated that to conciliate between the unity of faith and the multiplicity of cultures isn't conflictive but a task for all who profess the Christian faith. Let that come to pass. In Latin America, where half the world's Catholics live in a situation of chronic social injustice, a majority laments the election of a conservative Pope, who could help to open the door wider for the departure of the faithful. His continuity and his emphasis on centralisation will provoke a lack of credibility which will become visible over the next few years. The Church is out of step with the world. The Vatican and gay marriage - A few hours after the start of Pope Benedict's papacy, the first serious clash broke out between the Vatican and another state, none other than Spain, the cradle of the inquisition and one of the most ardent defenders of the Catholic faith. It remains to be seen how this unusual debate will develop in the old empire of the Catholic Kings and Queens.